Are you in need of a quick personal loan to meet your short term loan needs, such as paying off a sudden burdened bill or an EMI, or, making the desired purchase you wanted to, such as buying a new smart phone, or, even buying a vacation package to Goa? Today, online lenders can help you with an instant online loan in a more efficient and timely manner than the traditional lenders in India. Moreover, Financial Technology (FinTech) products like CASHe can help bridge the gap between your salary cheque and an additional financial need up to INR 100,000. Next time, if you do not have ready cash for an upcoming festival, CASHe can help you with an easy festival loan making sure you are festival ready. Why CASHe? Although it is easy to get a personal loan in India from a bank, you need to have the right documentation in place for availing even the smallest loan. Also, paper work can take time, and you may end up paying a late fee if your goal was to pay off an unexpected bill. Alternative lenders like CASHe can provide you an easy loan in minutes. The smart phone empowered customer. In today’s time, every customer lives on their smart phone, which drives what they buy. FinTech products such as CASHe empowers the buyer with short term loan solutions online. Once you download the CASHe app and register online, the app prompts the user to upload self-attested copies of the user’s salary slip, bank account statement, PAN card and an address proof document --that’s all. No further paper work. CASHe thereafter enables you to decide on the quantum of loan based on your loan eligibility. An instant loan gets credited to the user’s bank account in minutes. Let us take a look at the different types of small loans that CASHe can help you with: Festival loans The festive season is around. Do you need a small amount of easy cash for festival shopping? A festival loan is a short term loan that can finance your festival shopping requirements. Traditional banks are known to offer festival loans during the festive season at discounted interest rates. 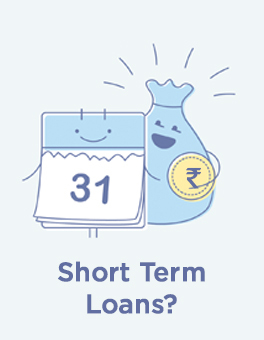 These are small unsecured loans and the loan amount can be as small as INR 5000. CASHe is an online lender that provides you with an easy festival loan on the go at the best possible loan rates. Vacation loans Need fast cash for a trip to Leh and Ladakh, or Goa? Your wait for that dream vacation is over NOW. A vacation loan is a short term personal loan that you can take from a bank or an alternative lender to finance your dream vacation. While the amount of vacation loan depends upon the salary you earn, or the income accrued, it is definitely easier to apply for such short term loans through an online lending platform such as CASHe for securing quick cash. You no longer need to lose your interest income by liquidating your savings to plan a dream holiday. If you are salaried, you are eligible to avail a short term vacation loan from CASHe instantly. CASHe gives you the flexibility of repaying your short term vacation loans in 15, 30, 60, 90, or 120 days depending upon your loan requirements. Consumer durable loans Setting up a new home in a new city? Need instant cash to buy electronic goods and appliances for your dream home? A consumer durable loan is a short term loan taken to purchase durable consumer products, such as refrigerators, microwaves, washing machines, desktops, laptops, printers, smart phones and the like. Both traditional banks and NBFC lenders provide consumer durable loans to the customer. Consumer durable loans are of two types, secured or unsecured. Alternative NBFC lenders like CASHe provides unsecured small loans to help you purchase your desired durable items based on your growing needs at tad cheap loan rates online. Marriage loans Need an easy wedding loan to meet marriage expenses? A marriage is an important life event. Insufficient funds can often dampen marriage preparations. A marriage loan is a short term loan that can finance your own marriage expenses, or the marriage expenses of your children, and dependent siblings. The eligibility criteria for short term personal loans for meeting marriage expenses vary from bank to bank but, depends mostly on the repaying capacity of the customer. For a valid marriage loan, the bride and groom should not be less than 18, and 21 years of age, as a mandatory criteria set by all banks. Loan processing charges apply with all banks and prepayment charges are also levied as applicable. Plus a lot of documentation is involved in a bank loan. CASHe, capacitates the consumer with instant online cash through its online lending platform, while saving enormous time that can get consumed in paper work. Download CASHe today to meet your small loan needs.